What is the difference between “To Fit Bust Size…” and “Finished Measurements” and what is ease all about anyway? If you ask me what size I am, you’re going to get a convoluted answer. It depends on the brand, it depends on the fit (that’s ease or how loose the garment is meant to fit). It depends on my mood and maybe even the weather. I’m only half kidding on that last one. One of my favorite things about knitting patterns is that, compared to store-bought clothes, it is really easy to figure out what size you need to make. Measure yourself. There are a lot of measurements you can take to really fine tune the fit of a garment. If you’re super anxious to get started there is one measurement you absolutely need – the circumference of your torso. To find this measurement get a tape measure and wrap it around your torso just under the armpit and don’t pull too tight! Keep the tape measure fairly comfortable and if possible do this with a friend or helper who can make sure that the tape measure is straight across all the way around. Compare your measurements to the pattern. Look for the set of numbers that says “To Fit Bust…” and choose the size that most closely matches your actual measurement from step 1. 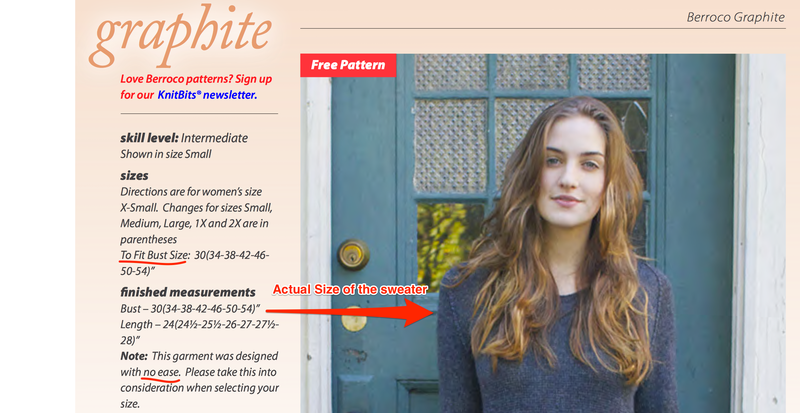 Look at the “Finished Measurements“ – this is the actual size that your finished sweater will be. If there is a difference between the numbers under “To Fit” and “Finished Measurements,“ that is the ease. Ease is how loose or tight the designer wanted the sweater to be. In this example, the intended ease is “0” so the “Finished Measurements” are the same as the “To Fit” measurement. It’s nice when a pattern includes a note about how much ease the designer intended when they planned the garment, but this isn’t always the case, so always look for a schematic. The schematic with tell the “Finished Measurement,” which you can then compare the “To Fit” measurement. I am so nervous about making a sweater. Posts like these are very helpful. Would you consider a series on reading sweater patterns? Hi Jen! Thanks for the great suggestion- I will start brainstorming that right now. In the meantime it might help you a little to read the posts I wrote about the Aidez sweater here and here. Not quite the same but maybe still useful. Thank you for the reply and links! A suggestion on posts about reading sweater patterns, if you would discuss some of the general concepts that typically happen in sweater knitting would give us some context and help us break things down. Using a top down raglan for example: A discussion on what happens in a neck band, a yoke, raglan shaping, etc. I am learning that usually there are no increases in a neck band, there are increases in a raglan and many times it will be a row of increases and a knit row (otherwise it puckers horribly as I have found out from a mistake! ), etc. Neck shaping scares the daylights out of me but I think it just because I don’t understand the basic concepts in it. People seem to love doing sweaters and I am having extreme anxiety over it after starting two different sweaters and abandoning them early on due to all sorts of things from poor yarn choices (bulky yarn is not necessarily easier to knit with!) to misreading the pattern. I may be asking too much so if you know of any good tutorials on the basics, that would be appreciated too. Thanks again and stay warm up there! If its not your largest measurement there are other things to do to adapt the pattern for a perfect fit. A whole slew of books have come out on this topic and there are many lively active conversations about modifications on Ravelry. I have to confess to feeling really irritated by this concept. Almost everyone assumes that when a bust measurement is needed, what we’re talking about is the traditional “across the fullest part of the bust”. If knitwear designers are thinking of torso measurement instead, they should say so! And we poor stooges who try to follow their patterns need to know if they all think this way or not – otherwise how on earth can we choose the right size to knit? (I suspect that many of them do still use the fullest part of the bust measurement, which makes it even more difficult for us to make the right call.) I speak out of several unhappy experiences of knitting something that turned out way too big without understanding why. Thats what we’re trying to help with! Using the “fullest” part of the bust will typically result in a too-large garment. 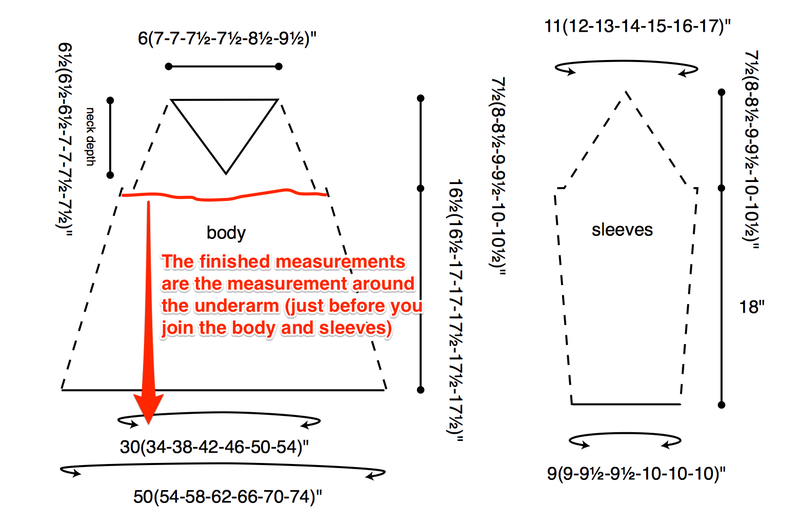 Does your measurements apply to men’s sweaters or is there another way to measure. I made a sweater based on pattern size and it came out way too large for me. I even decreased stitches from cast on. Thanks. Hi Jerry- that is the measurement that should work for everyone… Though it doesn’t account for fit preferences. To check that we recommend measuring a favorite garment. I understand the difference between “To Fit Bust Size” and “Finished Measurements”, and I also understand what “ease” is. What I don’t understand is why you would take the underarm measurement and use that as the bust size. I am a small busted woman, and my underarm measurement is 3″ less than my bust measurement. For a larger busted woman, this difference could be even greater. 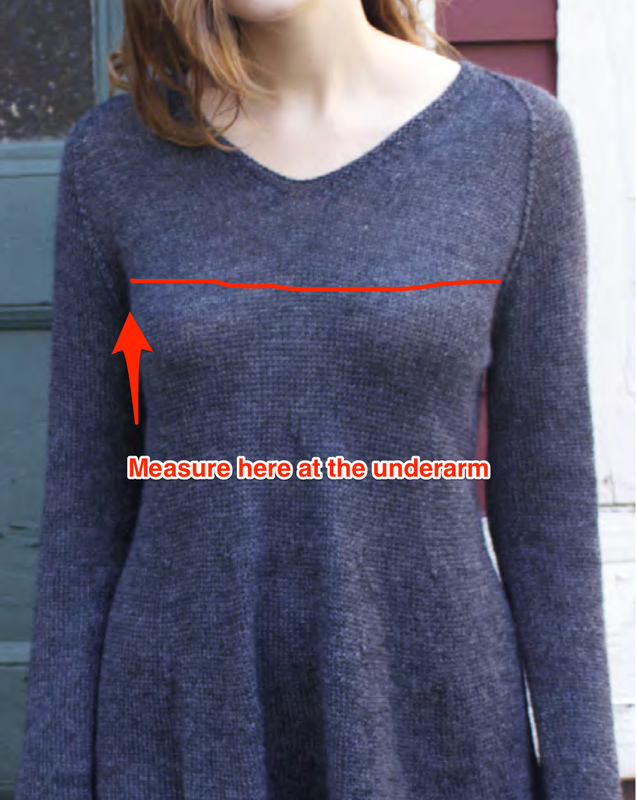 To my way of thinking, it should be the larger, actual bust measurement that one should be using when looking at the “To Fit Bust Size” numbers in a sweater pattern.